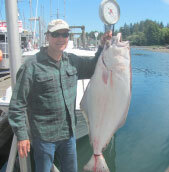 The two day salmon & halibut fishing charter is our most popular package. We can also suggest accommodations, if necessary. Catch Salmon or Halibut Guaranteed when you book two days with Braedy Mack Charters. We will guarantee you will catch Salmon or Halibut on one of those days. Or we will get back out and fish until we do catch salmon or halibut. Weather Guarantee: We cannot guarantee the weather, however we will guarantee that if we cannot get out of the harbor, we will give you a refund or fish another day. No Time Limit: We do not limit your fishing time, if you wish to extend the day. New for 2014, TUNA Fishing, weather and conditions permitting for an additional $500 per trip. This is one of the biggest advantages to booking your charter with us. We will not limit your fishing time as other guides may do who double book morning & afternoon trips during peak season. Even if we have caught our limit of fish for the day we will stay on the water to eco-tour for whales and wild life or continue catch and releasing salmon or just enjoy a cold drink in the sunshine; upon your request. Come and experience incredible Tofino. CALL TOLL FREE 1 – 888 – 732 -3077. Dock departure at 6am, for offshore bank fishing. A day on a 25 ft offshore salmon charter fishing boat with top of the line gear. The boat comes with a toilet and is covered to keep you dry & warm. All gear and bait for the day. Sage Salmon Rods & Islander reels for Chinook and Coho Salmon. Halibut rods & Penn 330 reels with braided line, to bring in Halibut. Fish Cleaning and packed on ice in your cooler. (Filleting, vacuum packing & -50 freezing is highly recommended to preserve that quality flavor) We can have staff waiting at the dock to immediately take your catch. We carry bottled water on board, rain gear and boots, if you require them. Camera, sunscreen, hat, sunglasses, food and drinks, motion sickness remedy if required, fishing license with salmon stamp, big cooler. Daniel my, 14 yr old son is still talking about Day 2 when we hit the school of halibut. Imagine catching & releasing a 30 lb Halibut in order to go for a Trophy Halibut. Jeff, we were very impressed with your lure set up for those halibut. Daniel and I will be back next year. * Total allowable possession per person, 8 salmon per person. Check with your captain for Dept. of Fishery changes and details. We suggest for 2 day trips, a 100 quart cooler. Your catch when processed or smoked can be shipped worldwide or donated to charity. Daily halibut catch limits over the last couple of years have been an unbelievable 100%. Weather permitting.